Father and son didn't cap the moment with a hug. 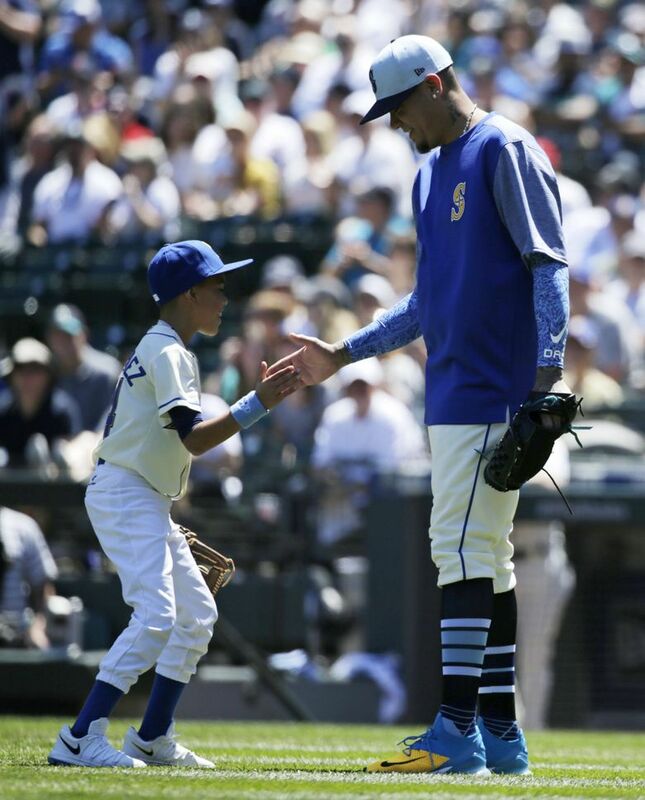 Instead Felix Hernandez and his son, Jeremy, unleashed an elaborate handshake as if they were teammates. 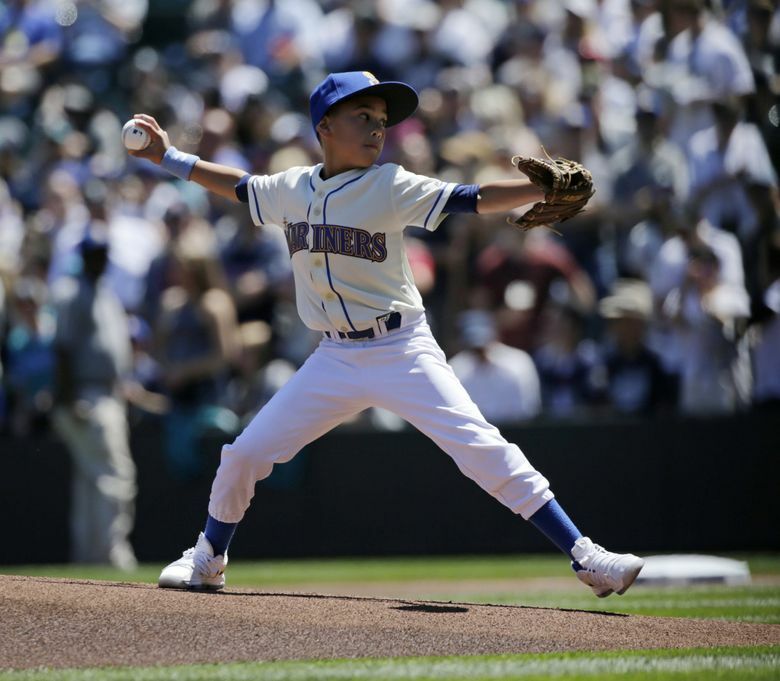 The Prince threw a strike to the King for the ceremonial first pitch, and the sellout crowd celebrating Father’s Day at Safeco Field roared in approval. 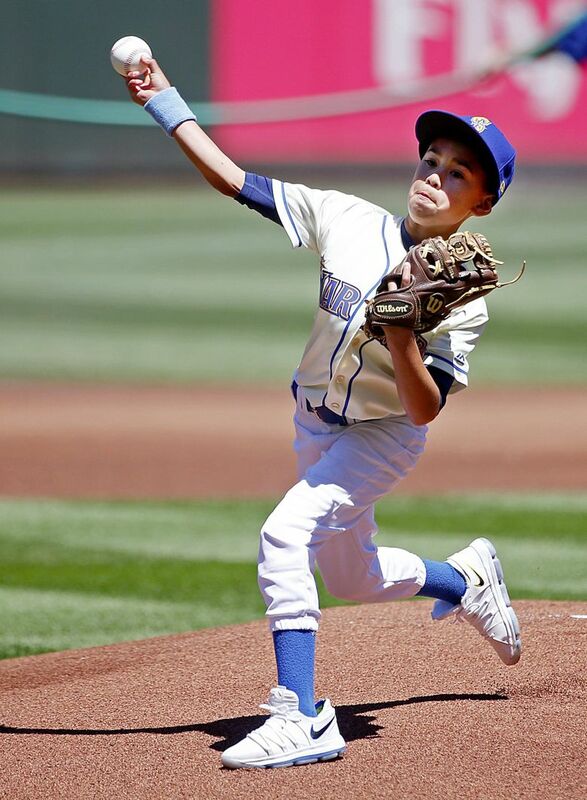 Clad in a matching uniform to the Mariners’ Sunday selection of royal blue and gold, Jeremy Hernandez, the son of Felix Hernandez, took to the front of the mound at Safeco, went into a near perfect pitching delivery — probably more fundamentally sound than his pop’s — and fired a pitch with more pace than expected. Father and son didn’t cap the moment with a hug. Nope, instead Felix and Jeremy unleashed an elaborate handshake as if they were teammates. And, no, the Mariners can’t sign Jeremy Hernandez to a contract just yet. 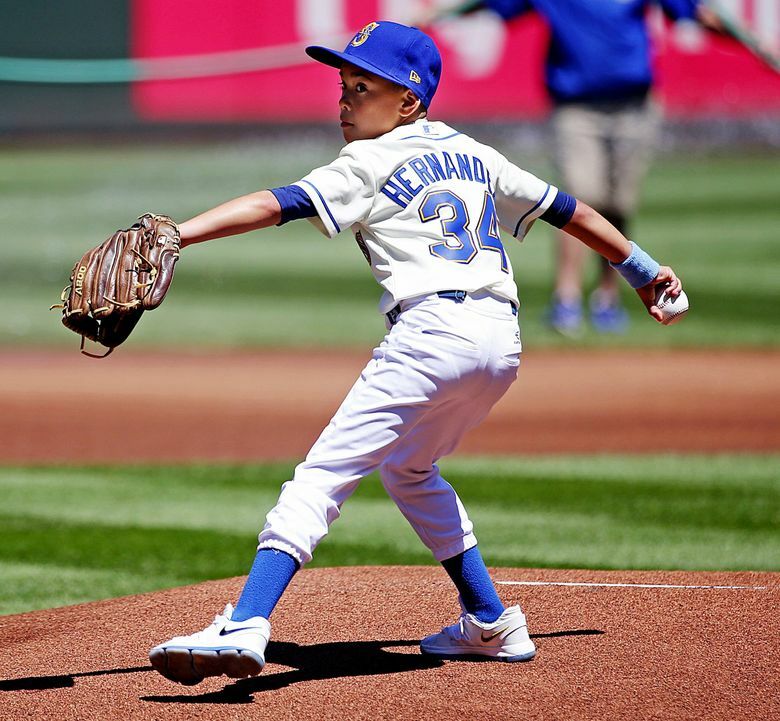 Much to the dismay of his dad, Jeremy would rather follow in the footsteps of Jean Segura and play in the field than be limited to pitching every so often. 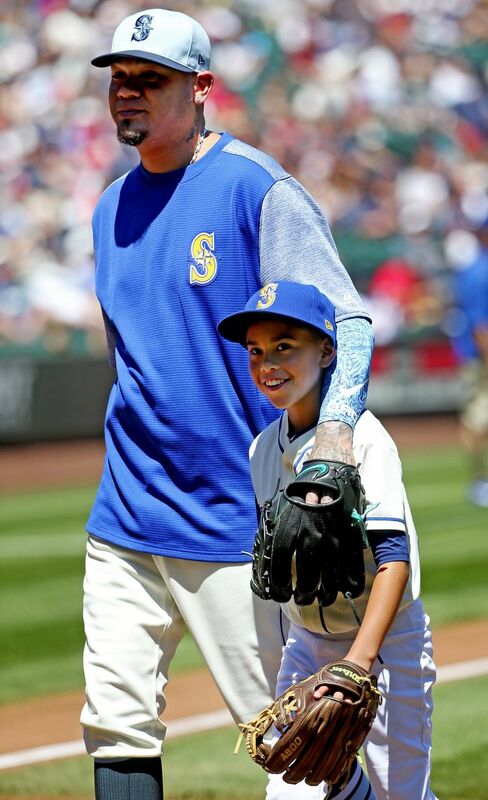 The nice father-son moment was one of several things that the Mariners and Major League Baseball did to celebrate Father’s Day. There was also very touching video that featured the children of Mariners players, coaches and staff wishing their dads a happy Father’s Day. Dads, their children and baseball — it’s a very powerful combination. Admittedly for the players and the staff, being a baseball dad isn’t typical. The time away can be difficult. Servais has been a baseball lifer. After playing professionally for 13 years, he went into scouting and then moved up to the front office and is now managing. That’s a lot of time away from home. He’s admittedly relied on his wife, Jill, when it came to raising their three kids. Sometimes being a dad takes precedence. Servais missed two games this season to be there when his daughter, Jackie, received her Master’s degree from Ole Miss. And he was quick to scratch Kyle Seager from the lineup of a game, when his pregnant wife, was experiencing some health issues. Servais made sure to call his father, Dan, as well. Servais took his father on the recent road trip to Houston and Tampa. And now Dan is offering managerial advice. “He’s still talking about it, ‘That Dee Gordon, you got to make sure he keeps eating. He’s awful skinny.’ I know, Dad. I know. ‘It’s going to be hot on the east coast …’ I know, Dad. I got it,'” Servais said. In the Mariners clubhouse, Wade LeBlanc has a trophy in his locker that says, “No. 1 Dad” courtesy of his sons, Jackson and Eli. The trophy has a hitter on top though. “They didn’t have a pitcher or a left-handed hitter, so you take what they have, I guess,” he said. LeBlanc wasn’t sure he was deserving of that trophy … yet. Right-hander Juan Nicasio (right knee swelling) is expected to be activated from the disabled list before Tuesday’s game in New York. Right-hander Nick Vincent (groin strain) will start a rehab assignment on Monday. He is scheduled to pitch for Class AAA Tacoma on Monday night at Cheney Stadium and then again on Wednesday for Class AA Arkansas. If all goes well in those two outings, he’ll be activated for next weekend’s series in Boston. Catcher Chris Herrmann (oblique strain) could also be activated from the disabled list on Tuesday in New York. Herrmann has been playing a week’s worth of games with Tacoma on a rehab assignment.